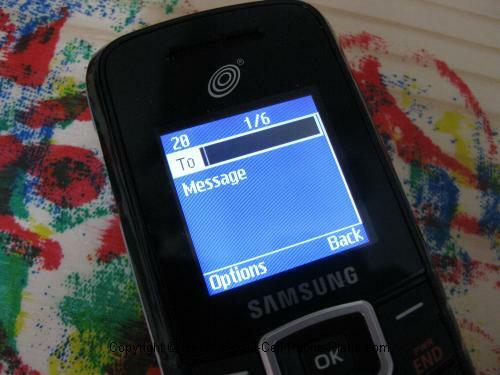 The Tracfone Samsung T105g candy-bar style phone was introduced in early 2010. This sleek, basic phone costs only $9.99, but it may be too expensive for you and me. Read on to find out why. This handset is now available as a double minutes phone so you get 120 minutes from a 60 minute card, etc., just as you do with the other double minute Tracfones. It's still a better deal to get a Tracfone phone plus airtime card bundle, but over the long run, the costs will be about the same. 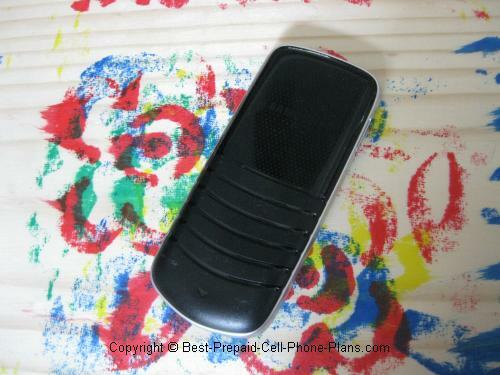 This phone does not receive picture messages. When you send it a picture message, it appears to have been sent successfully, but it never arrives on the phone. The T105g was originally released as a single rate single minutes phone. Simply put, no matter where you call from in the US, you always get charged the same rate. However, when you buy an airtime card in a store or online, you only get the face value of the card plus any bonus minutes if you have a promo code. So, for example, if you buy a 120 minute card and use a 30 minute promo code, you will end up with 150 minutes because it is (was) a single minutes phone. Compare that to what happens if you buy the same airtime for a Samsung T301g. You would double the 120 minutes to 240 and still get the 30 bonus minutes (these don't get doubled) for a total of 270 minutes. That's a pretty big difference. However, the T105g was later available as a double minutes phone, so this was no longer an issue. Finally, it was replaced in the line-up by the S125G. So what's the phone actually like? This phone is light and sleek with a solid feel. It may not have a whole lot of features, but despite its price, it feels like a well-build phone rather than a cheap piece of plastic. I like the back cover design. There a two small hooks in the back cover that connect to the phone. The cover holds tightly (unlike the cover of the T401g) but is still easy to take off (though you won't really need to do that). There is a sliding door to cover the charger/headphone socket. 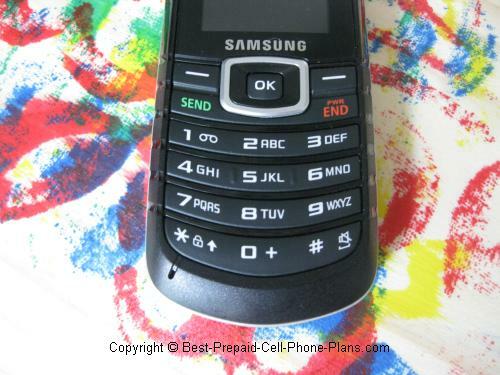 This is an improvement over the other Samsung Tracfone and Net10 phones which have a piece of plastic that covers the socket which you have to dig out with your fingernails. The Keypad is okay. There aren't separate buttons, but there are grooves to identify the center "5" key, so it is possible to orient yourself to the keys without having to look at the phone. 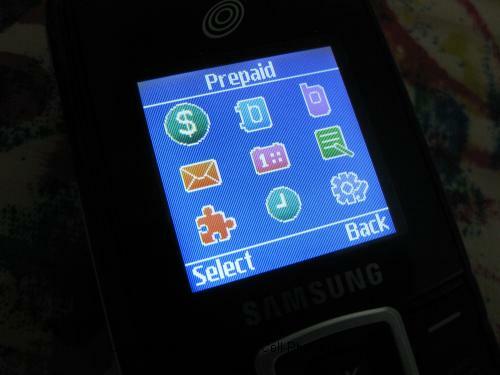 The Tracfone Samsung T105g has a limited but still useful set of applications or utilities including a calculator, calendar, stopwatch, timer and alarm clock. One application that isn't included is a web browser which may be a positive thing for some people. This means you'll never accidentally press a web browser button and end up losing an airtime minute before you turn it back off. Despite the small screen, the calculator is still convenient to use because the scroll keys are used for the arithmetic functions. The old small screen phones like the Nokia 171 had a difficult to use calculator, but the one on the Samsung T105g is just fine. Go to Settings -> Profile -> Choose a profile then select -> Options -> Edit. Then you can choose the various sounds including the ringtone, the call alert tone, the message alert tone, and the keypad tone. 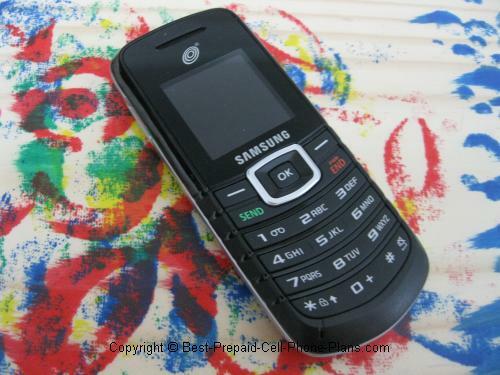 As you can see, other than the single minutes features, the Tracfone Samsung T105g is quite a nice phone. You can use it as a backup or as your main cell phone. If you use it as a backup, I would suggest charging the phone and then removing the battery so that it doesn't slowly drain while in the phone. You'll still have to charge the battery every now and then. If you use it as your main phone, I suggest you do a double minutes conversion on it by either applying the double minutes conversion card or getting the one-year double minutes airtime card. Great, tell us about it!